Set in the countryside in a Provençal-style building, this property features an outdoor swimming pool with a panoramic view of the Cevennes Park, a well-established garden and a traditional restaurant. Free private parking is provided. Individually decorated with objects coming from all over the world, each air-conditioned room at La Santoline includes a private bathroom with free toiletries, an LCD TV and a balcony or terrace. A buffet breakfast is served every morning and the restaurant is open daily except on Tuesday. Free internet access is provided in the public areas in some of the rooms. During colder days, you can relax in the indoor heated pool. Excursions and tours are organised by the staff. 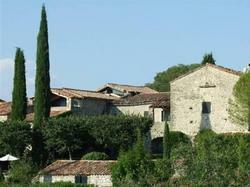 The Ardeche Gorges are 20 km away and Aubenas is a 45-minute drive from La Santoline. This suite has a well-equipped kitchenette and a garden area. This air-conditioned studio features: - a double bed - a fully equipped kitchen with a dining area - a terrace with barbeque facilities - a living area with a TV - a private bathroom with a bath. These air-conditioned rooms feature an LCD TV, private bathroom and free toiletries. One has a rooftop terrace while the other has a terrace that looks onto the garden. This air-conditioned room has private garden. An LCD TV, private bathroom with shower and bath, and free toiletries also feature in this room. This air-conditioned room has a balcony or terrace with garden views. An LCD TV, private bathroom and free toiletries also feature in this room. With a garden view, this air-conditioned suite features an LCD TV, private bathroom and free toiletries. Extras include more space. With a garden view, this air-conditioned room features an LCD TV, private bathroom and free toiletries.